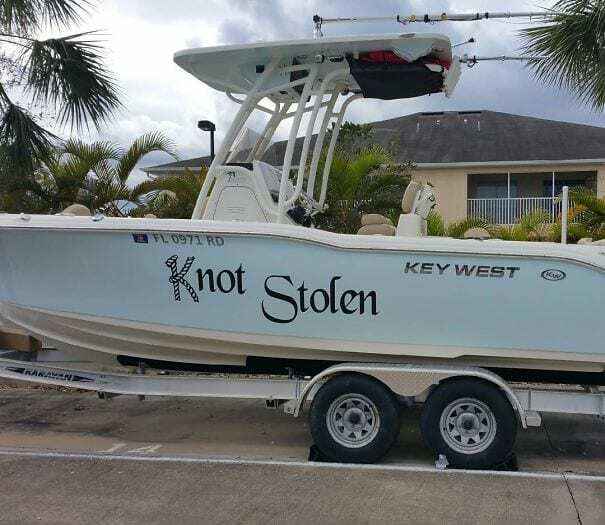 Naming your boat is not a responsibility to be taken lightly. When people acquire a new sailing vessel, they will often think for hours about what to name it. 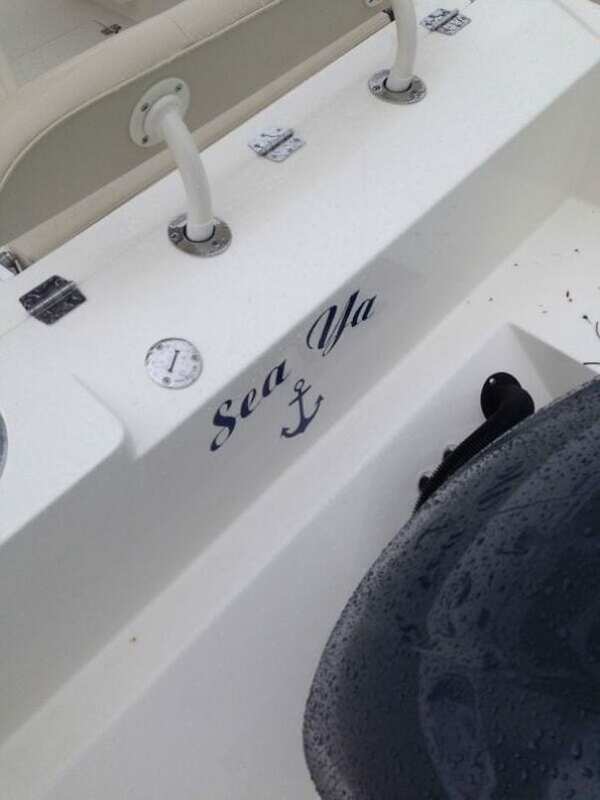 You see, the name of the boat is seen by everyone, and boat owners are looking for a name that means something to them and will bring their vessel good luck. While some of the names that boaters choose are very personal, others are creative and even laugh out loud funny. The tradition of naming boats began more than a thousand years ago, when sailors used to name their ships after gods, goddesses, and saints in order to bring good luck to their voyages. It was believed that the god which you named your ship after would look out for you and protect the ship and its sailors on the open water. Name your boat the wrong thing, however, and it could end up on the ocean floor. Even if you don’t believe in luck, naming your boat is still important because at sea, you are simply known by the name of your boat. Name your boat something strange or unpleasant, and that will be the way that you are identified every time you take to the water. Today, people name their boat after all sorts of things. 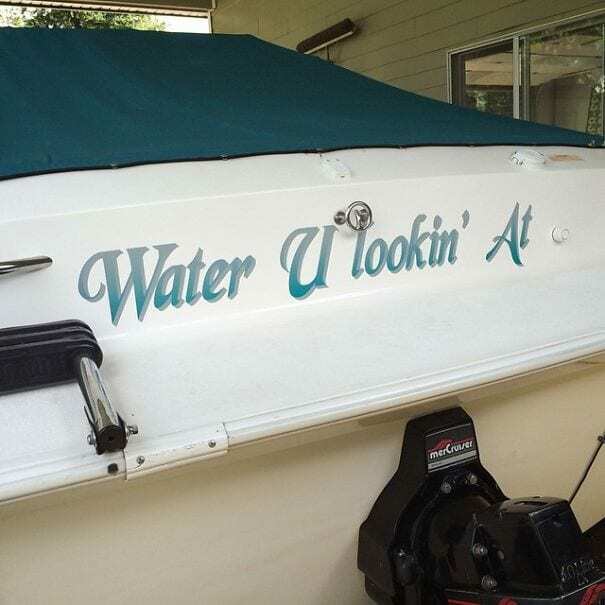 Lovers, pets, and family members are common, but people are also always looking for clever names and puns that they can put on the side of their boat as well. 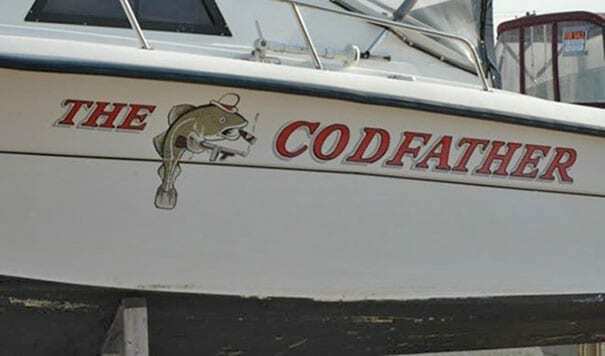 We’ve gathered some of the funniest boat names ever thought of. Some of these names will make you smile, while others may simply make you scratch your head and wonder what they were thinking. 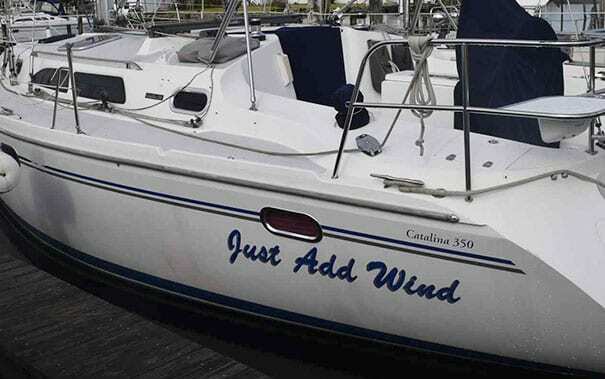 This clever boat owner used a play on the name of one of the fastest men in the world for their boat. For those who don’t know, Usain Bolt has eight gold medals from three Olympic games, and holds several world records on top of that. 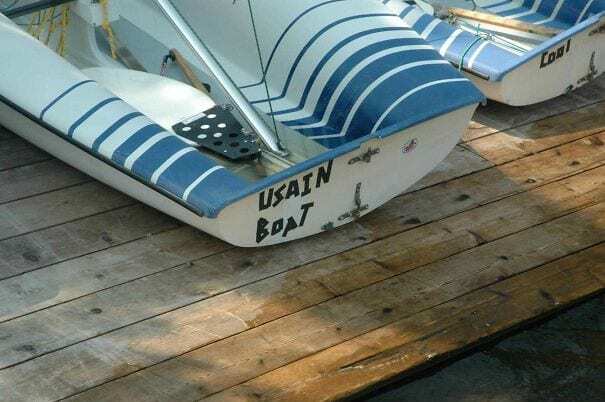 So, we suppose that the person who named their little vessel Usain Boat is claiming that the boat is pretty quick. But if there was a race between the boat and Usain Bolt, there’s no telling who would win. It seems that someone made the owner of this boat an offer they couldn’t refuse. One of the most famous and critically acclaimed films of all time, The Godfather is a crime drama film starring Marlon Brando and Al Pacino. It tells the story of a fictional crime family in New York City and was so popular that two sequels were made. The creative name of this boat makes us imagine a whole mafia of fish, playing out their drama under the sea. 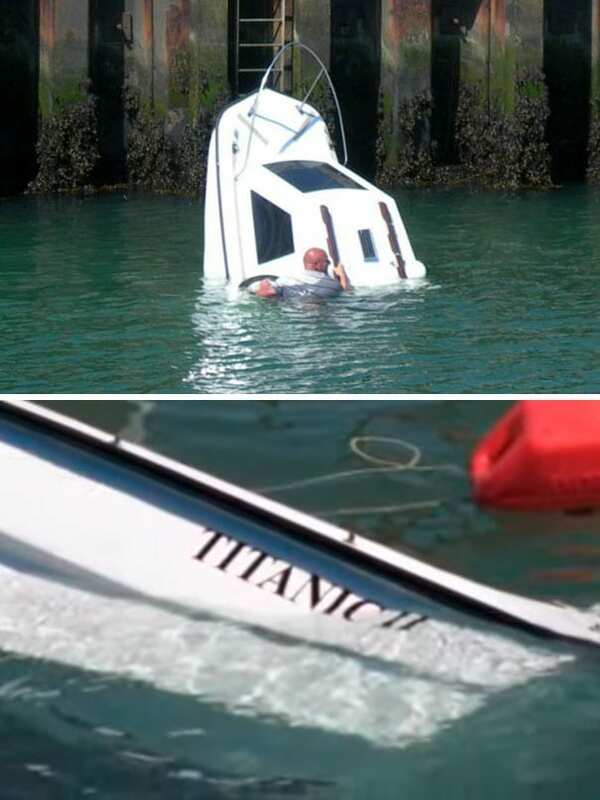 When the person who owns this boat decided to name it Titanic II, perhaps they destined their little vessel to the same fate as the original ship of the same name. However, we hope the passengers of this Titanic fared better than the passengers on the ship that hit an iceberg and sunk in 1912. While we’re no experts on ship naming, we would probably steer clear of naming a boat after one that met such a tragic fate. It’s important to make sure you get enough vitamins and minerals so you can stay healthy and happy. 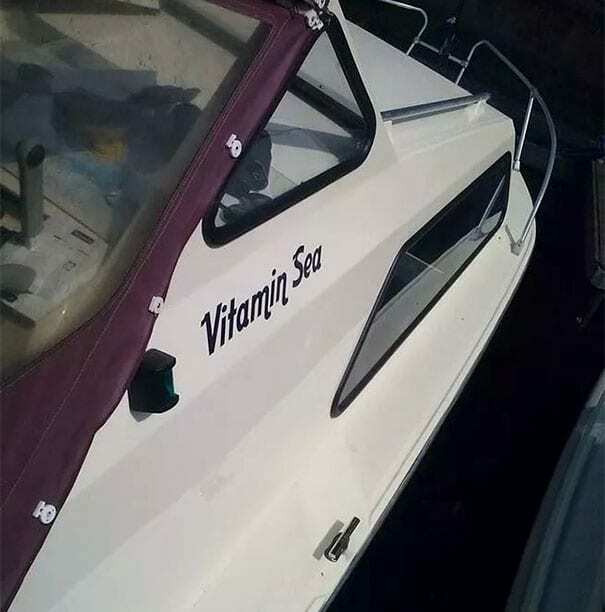 This boat is sure to help you do just that, offering you vitamin sea for days. Just hop aboard and you have the best cure for all your ailments – sea, salt, and fresh air. It’s also just plain fun to spend a day at sea, and we’re no doctors but as far as we’re concerned, that’s as good as any vitamin out there. The puns just keep on coming! This one is very clever, but could be a problem if the boat gets into trouble on the open water. You see, when maritime police are trying to get the attention of a vessel at sea, they usually call out to the boat by name. So when they shout, “Hey, Water U lookin’ at,” it could lead to a whole lot of confusion. Let’s just hope it never comes to that. 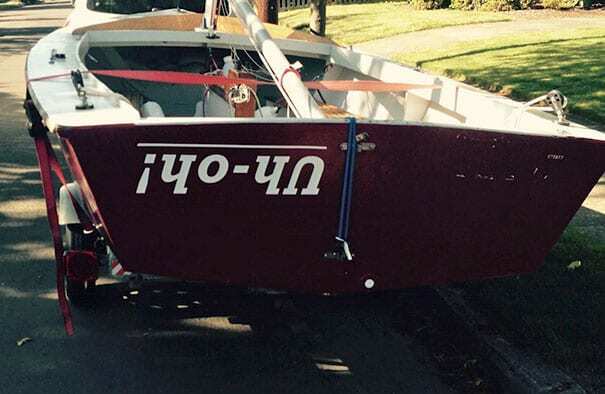 The name of this boat appears upside down – unless the boat itself is upside down! How fitting. If the boat flips over on rough seas, then the message will be right side up, and visible to everyone. It will also be appropriate for the situation, and actually quite funny. While we hope it never turns into a dangerous scene, we understand that sometimes boats flip over, and as long as they’re prepared and have life jackets aboard, everything should work out okay. “Which boat is yours?” asks the owner’s friend. 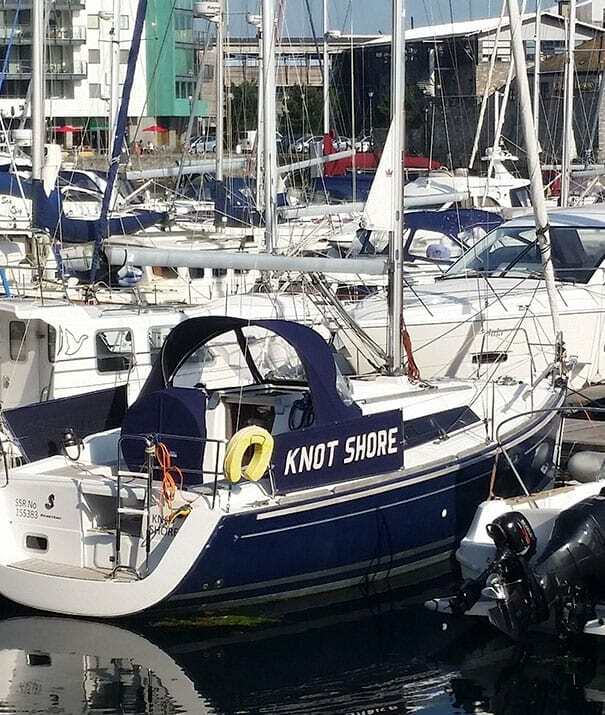 “Knot Shore!” answers the owner happily. “Wait a minute. You don’t know which boat is yours?” says the friend incredulously. And it goes on like this for a while. This is how we imagine the conversation plays out every time the owner of this boat takes new friends sailing. Whether or not that’s actually what happens, it’s a great name in addition to always being a certain conversation starter. This is a sweet name. 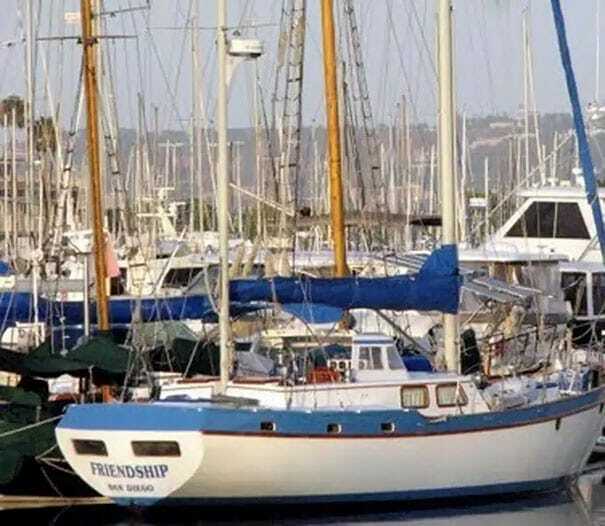 If you’re going to name your boat after another ship, friendship is a pretty good choice. After all, who’s going to say no when someone asks if they want to take a sail on the Friendship? It’s a clever name without being sassy like a lot of the other boat names we’ve seen here. We’re still waiting to see a picture of its sister ship, which would be a missed opportunity if it’s not named Companionship. Calling a sea vessel Unsinkable definitely makes more sense than calling it something like Titanic or Oh No. You want to take pride in your boat, to feel confident that it’s not going to flip over no matter how wild the seas. And that’s what this owner did, calling their ship something strong and sure. 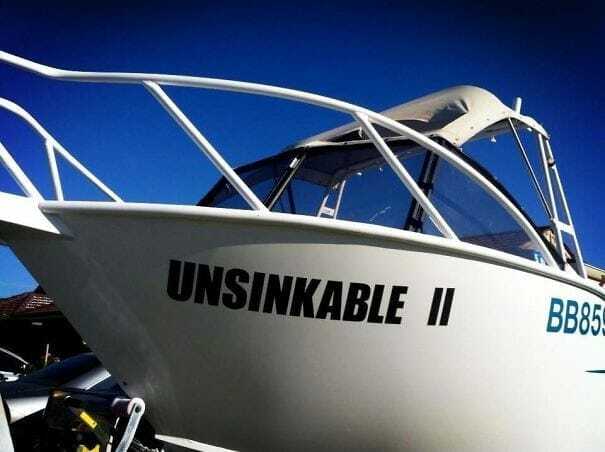 However, the first thought that comes to mind when we see the name of this boat is: what happened to Unsinkable I? Homophones are words that sound the same but are spelled differently and have different meanings. We bring this up because sailors and boaters are lucky that there are so many homophones related to the sea (see?) that they can play with to create fun boat names. 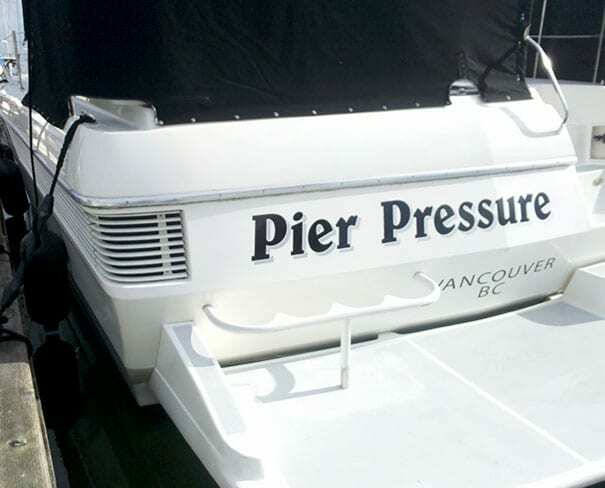 Pier Pressure is another one of these. We’re sure the boat is feeling the pressure from the pier, but it’s not as bad as the peer pressure that the owner feels to take their friends out on the water. This is our favorite, and it’s not just because it’s a picture of a bunch of pugs. This one’s a play on the word tugboat, which is a vessel that pulls or pushes other ships when they can’t move or maneuver properly on their own. 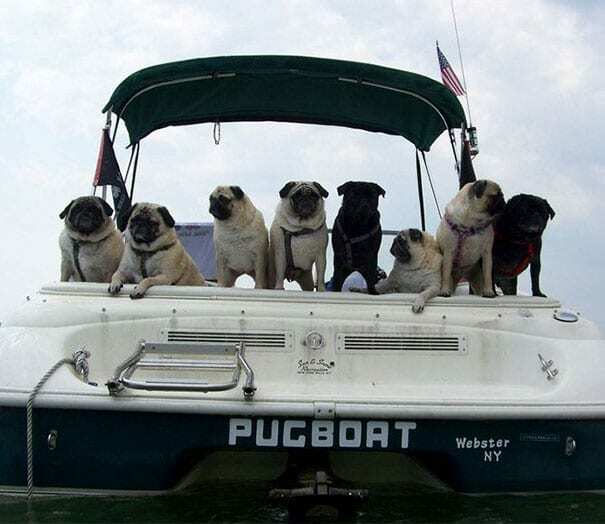 Even though we’ve never heard of a Pugboat before, we’re pretty sure it’s simply a boat full of pugs, which sounds like one of the best ideas we’ve ever heard, and is definitely more fun than a regular old tugboat. 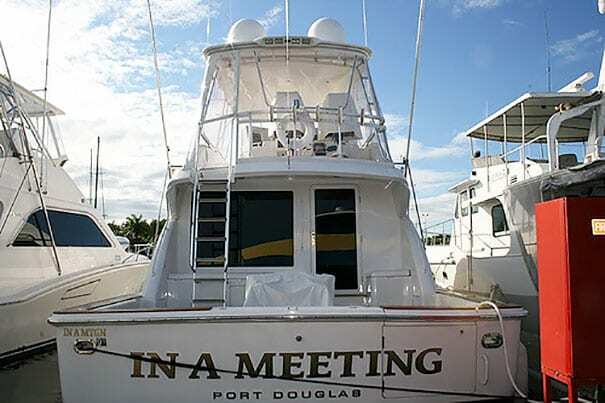 The name of this boat gives the owner a very nice excuse every time he wants to go out to sea without being disturbed. He just has to tell whoever’s asking that he’s in a meeting. However, anyone who truly knows them knows that any time the owner of this boat says that they are in a meeting, you really can’t believe them. While it’s always possible that they actually are in a meeting, chances are that they are out on the sea aboard this very nice boat. We think this one looks especially funny in the fancy typeface on the boat hull. Yeah boy is a slang term that reportedly started as Flava Flave’s catch phrase announcing that everything is good, and now is used as a general exclamation of awesomeness. So when you name your boat Oh Buoy, it should bring pretty positive vibes to your boat and to the times you’ll spend at sea. It’s also the appropriate answer any time the owner asks their buddies if they want a ride. While this is a pretty nerdy name for a boat, it’s also unique and we appreciate that. 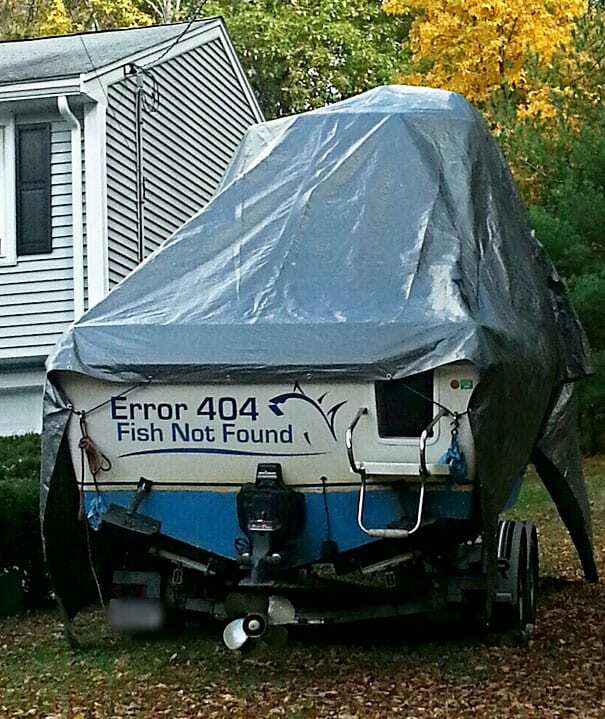 Error 404 is the message you get when you are surfing the web and try to follow a link that is dead or broken so the server can’t find the page you are looking for. So, with this message on the side of the boat, we can only assume that the people who sail it are not very good fishermen, or that they’re trying to catch fish with broken equipment. 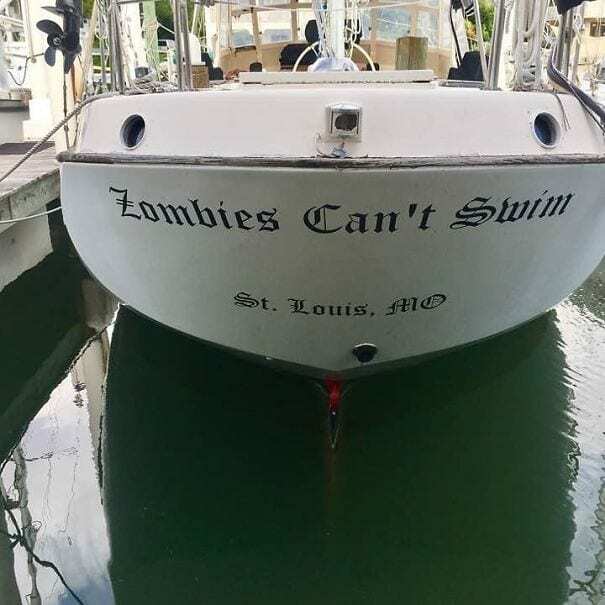 In case of zombie apocalypse, this is the boat you want to be on. The person who named it is right – according to most zombie literature, they can’t swim. So when they take over the landmasses, you can just escape into the water. If the owners of this boat are really prepared, this boat is likely to have a large supply of water and nonperishable goods on board. That way, whoever makes it on board will be able to survive until the zombies wipe themselves out. These two boats definitely go together. Either they’re owned by one person who couldn’t make up their mind, or perhaps by siblings or a husband and wife who bicker all the time. Their boats carry on the conversation for them, so they don’t even need to speak in order to continue their argument on the high seas. We like the idea and think it would be pretty funny to see a race between these two little motor boats. Not only is the name of this boat based on the hit drama series Breaking Bad, it’s printed on the boat’s hull to perfectly match the show’s logo. Breaking Bad was a very popular AMC crime drama series starring Bryan Cranston, that ran from 2008 to 2013. 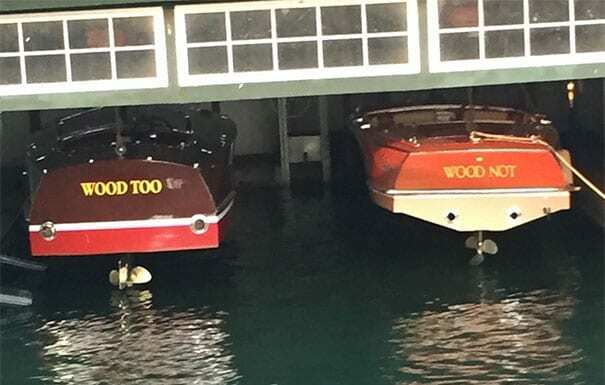 The owners of this boat must have been fans, judging from the play on words that they came up with. 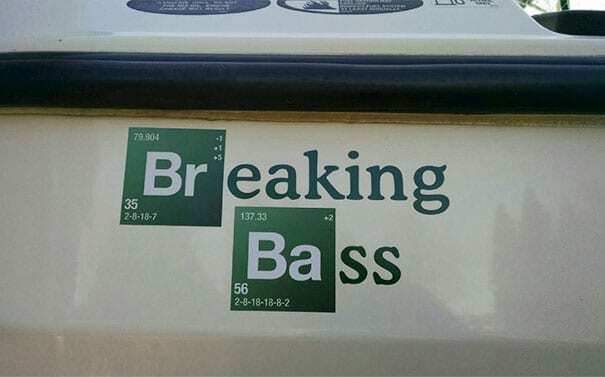 Combining two of their loves – fishing and Breaking Bad – gave them this fun boat name. This is the attitude we’re looking for on the open water! 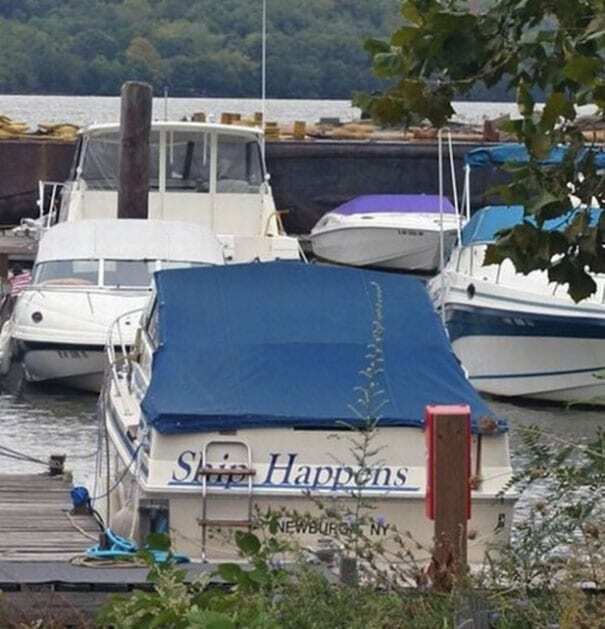 A play on the famous adage that people say when things aren’t going their way, it’s a laid back, chilled out kind of lifestyle, and the clever name of this boat fits it well. When life is hard and work is tiring, you can hit the waves and take a break from it all on this boat, proudly announcing that no matter what’s going on in the world, ship happens and we can overcome it. Simple yet cheerful, the name of this boat tells you just what you need in order to have a nice day out on the sea. Unlike a motor boat, which requires things like fuel, If you have a sailboat, all you need to add is wind and you have everything you need for a fun and relaxing time. Of course, you also need to bring someone who knows how to sail along with you, but that’s probably a given. The words “about” and “a boat” are spelled very similarly, and even sound alike, especially if you are Canadian. 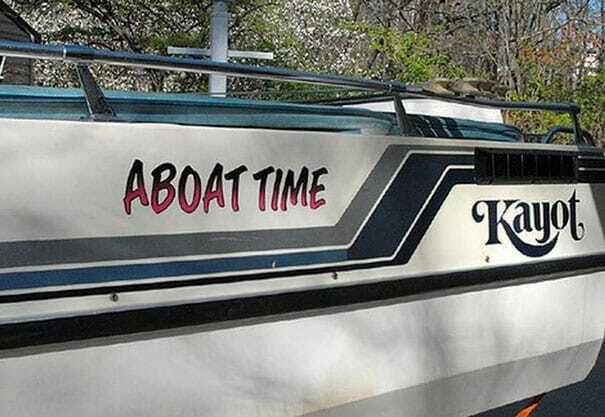 The name also works both ways, because when you’re ready to go out on the water, you can say “It’s about time!” and also “It’s a boat time!” and everyone will know exactly what you’re talking about. This is another one that is fun and light-hearted and perfectly matches the boating lifestyle. It’s sure to make the other people who see it smile as well, which adds bonus points. Seize the day is a very well known saying, translated from Latin. It shows up in a number of movies and across pop culture, notably in the drama film Dead Poets Society. 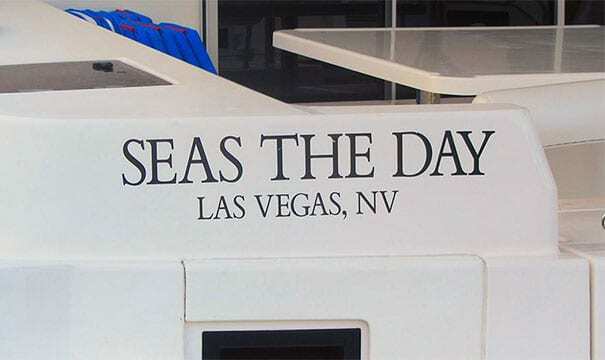 So, since the words “seize” and “seas” sound the same, it makes for a very uplifting boat name. We’re completely on board with this one, and think that every day is the perfect day to Seas the Day and sail out to sea on this beauty. Last but not least, we would like to leave you with this final boat name. See ya is a very common way to say goodbye, so it only makes sense that when you want to say farewell on the water, you should instead say, “Sea ya.” Even though you can’t hear the difference, you can certainly see it when it’s printed on the hull of the boat. If we saw this one at sea, we would definitely give them a wave and a smile.